Goldentyre products are created to satisfy the needs of professional riders, sportsmen and women, and enthusiasts. Product development is also a result of the close collaboration between the brand and teams from the various motorcycle disciplines: Motocross, Enduro, Rally, Minicross, Trial, Speedway, Flat Track and Supermotard. 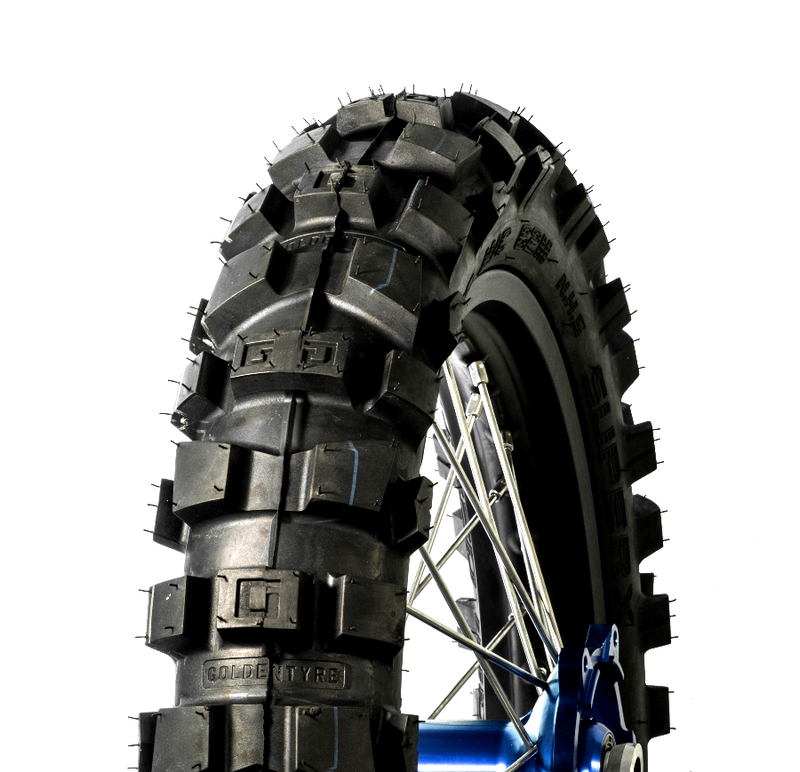 The GT369/369X tires are specifically designed for the rigors of Endurocross and Superenduro racing. Tested and developed by Taddy Blazusiak to meet the special demands of Superenduro courses. Available in both our standard compound and our exclusive “X” gummy compound for unmatched grip no matter the conditions. The reinforced sidewall combined with our state-of- the-art production process have yielded the most dynamic Endurocross tire on the planet! The GT216X rear tire is the gold standard for extreme enduro competition. Designed after the GT216HBN, the X version features the exclusive "gummy" compound to create the best gripping tire in the world. Proven time and time again by the top riders in Red Bull Hard Enduro Series as the best choice for extreme terrain. If you are looking for the best traction on the planet, you search is over! The G-Mousse is the next generation of inserts from Goldentyre. After a year of intense testing and development, the G-Mousse is now the most technologically advanced insert on the market. Our revolutionary polymer construction combined with a dual heat treatment production process has produced the most consistent and durable Goldentyre Mousse ever! The G-Mousse product line is designed to replace conventional inner tubes to provide 100% flat protection in the most extreme conditions in the world. When the race is on the line and can't afford to have a flat, this is the product for you!